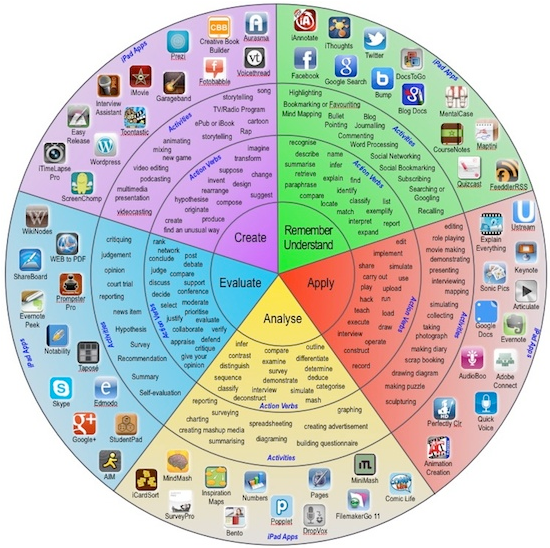 The name of this wheel is a play on the combination of "pedagogy" and "iPad" and demonstrates how different iPad apps can be used in conjunction with the levels of Bloom's Taxonomy. The idea is to adapt pedagogy possibilities with mobile devices, in particular the iPad. The Taxonomy wheel was first discovered on the website of Paul Hopkin's educational consultancy website and was produced by Sharon Artley and was an adaptation of Kathwohl and Anderson's (2001) adaptation of Bloom (1956). Click Padagogy Wheel for the pdf version of the wheel that is much easier to see and use. Click here for another resource that applies iPad apps to the levels of Bloom's.